My build reports are generally technical in nature, but some of them contain references, tips and tricks, or details experiences with some aspect of a project that others may find helpful. I’ve also written some more comprehensive, independent pages and posts on some topics. Here’s a collection of posts which I think have a particularly high concentration of technical information. My Instructables member page contains some guides on how to build things. How to Build your Everything Really Really Fast: a comprehensive(ish) guide to building robust structures and mechanisms, geared those with some mechanical engineering experience, or largely theoretical experience. It’s presented in a “tactics of battle” format and contains little theory. ChibiKart – step by step construction of the Democratic People’s Republic of Chibikart. Electric Scooter Power Systems: As of 2014, just a bit outdated, but it is still a primer on using brushless model and R/C parts, as well as dedicated small EV parts, on your silly rideable device. My “2.00gokart” EV design class materials, largerly written by myself, are below It is a fairly comprehensive collection of notes on all steps of the design process of a small electric vehicle, from parts selection to vocabulary to building techniques. The course was taught using HTBYERRF as a “textbook” reference. Summer 2014 version: ZIP file contains weekly “Milestone” check-in and requirements for an 8 week short summer program and a 13 week typical academic semester program. Contains all lecture notes and other reference material to which I hold sole rights. These particular posts are heavy on design or technical content. I confess – I’m actually Course VI. Actually no, but I have an Eagle parts library full of some of the random semiconductors I use which other aspiring motor controller builders might find useful. This gets updated occasionally. How to tune open source multirotor firmware for driving brushless motors for BIG ROBOTS: For Dummies. 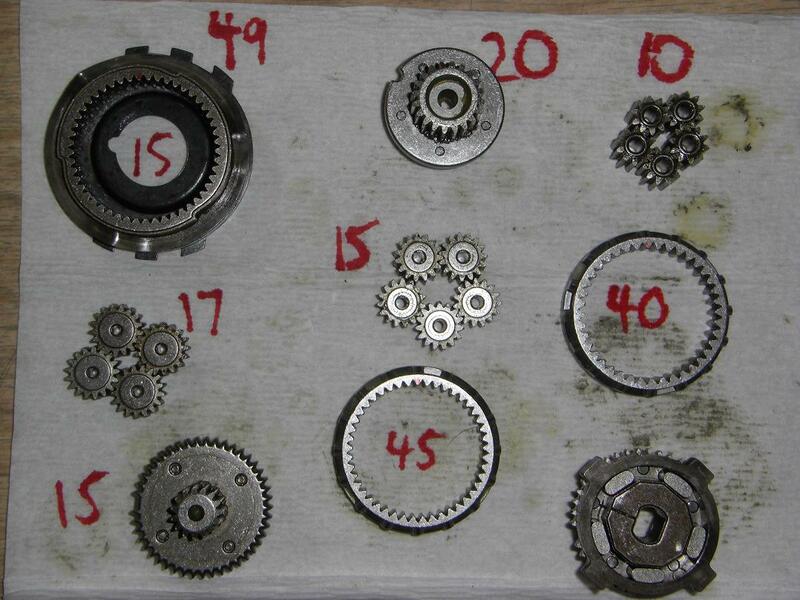 A picture of the gear stages inside a DeWalt 3 speed gearbox. Motor on the top left, geartrain goes down, right, up, right, and down again. Taking apart, modding, and upgrading generic Chinese sensorless BLDC controllers, nicknamed “Jasontroller”. An extensive guide to several different Chinese sensorless BLDC controllers for vehicles. Collectively now named “Wangtrollers”. Is your Chinese e-bike controller magic and can learn its own sensor combos? Find out. Another episode of Chinese e-bike-controller mongering, the Mini-Jasontroller, and other friends. Use cordless saw parts in your robot alongside cordless drill parts. Design your own Wubba Wubba Drive. Smart, or at least vaguely intelligent, current limiting for brushed ESCs. Playing with Inexpensive Chinese Brushless Motors in Inexpensive Chinese Ducted Fans. Make-A-Bot needs tuning, so here’s How to Tame Your 3D Printer part 1. Combine a CIM motor and a shady e-bike gearbox into a weird floating-output gearmotor. Part 1, part 2. The HexBridge Shield for Arduino, in case you ever want to control more power than an Arduino ever should. Everyone loves FANKART! but what I love most about it is the ninja propshaft adapter about halfway down. Use XBee wireless modules as virtual wiring harnesses to control your simple-yet-multiply-actuated contraption. The Maxon DEC 50/5 is a 50 volt, 5 amp simple BLDC motor driver, available to you, the adoring public, here. Face Vector Modulation is a (conceptually) simple state-machine based brushless motor commutator. Part 1, part 2, part 3. One of my first useful projects was a custom tool holder for the MITERS metal lathe. I got hooked, and quickly followed up with a cutoff holder. I can no longer find the videos. Segfault‘s analog balancing filter. Several iterations, the latest of which is here. Previous work on the controller, in reverse chronological order, are in Update 5, Update 4, and Update 3. The version that actually works. LOLrioKart‘s 6th motor controller featured variable regeneration and electronic reverse. The giant gear-filled thing that hangs off LOLrioKart’s rear axle is a planetary differential. Exploring the IR2184 half-bridge MOSFET driver. My Instructables writeup about how to build your own RazEr scooter for fun and profit. Speaking of RazEr, I quickly document how you can characterize your small brushless motor here at the bottom. Cold Arbor is my latest use-one-of-every-chapter-in-your-engineering-book (except not really) project, but the most important part is the robot’s assembly with zinc-aluminum brazing alloy. When I was a lab assistant for MIT’s 2.007 class (to atone for my sins), I created two small documents to help students along: How to Build Your Robot Really Really Fast, and Caliper Abuse for Beginners. Some explorations of the Honeywell GG480 missile gyro. Neither my project, nor very technical, but here’s a walkthrough of the New Media Lab. If you need a source of stators for your hub motor, here’s my catalog of laser printer motor part numbers and their associated stator dimensions (XLS). Here’s some of the parts I’ve digitized for projects. My preferred mechanical software is Autodesk Inventor (.ipt and .iam), but most of these have been genericized as much as possible. Board files are provided as raw Eagle files and Gerber 274X with Excellon type drill file. Colsonbot 2… what does a Colsonbot do? You saw them here first! RazErBlades electric wireless hub motor skates. Native Inventor files only. Very detailed model of the BaneBots P80 2-stage gearbox. Moderate detail model of the BaneBots P60 1-stage gearbox. An Overhaul 2+ drive motor – HobbyKing Sk3-6374 attached to a P80 Gearbox, with support bracket. Those stupid e-scooter brake calipers that nobody ever can dimension. For reference only – usually they have the same mounting holes, but not always! Boards are here exclusively for reference – they may not work as-is, and may in fact require a few wire hacks and trace cuts here and there. Reading the build post is recommended. Theme created by miloIIIIVII | WordPress | Entries (RSS) | Comments (RSS) | 30 queries. 0.284 seconds.